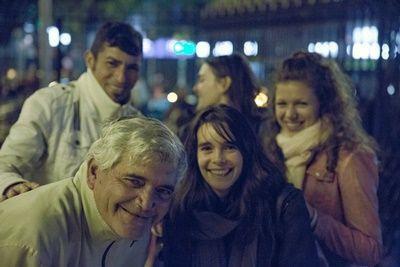 Efforts by the Projects Abroad Human Rights Office in Argentina came to fruition on Tuesday, May 3rd, when a formerly homeless man named Gabriel received his first pension check from the Argentine government. Human Rights interns in Córdoba have been working for several months with Gabriel and his partner, Viviana, to receive their disability pensions from the Argentine government. They came to know the couple through weekly outreaches with the local homeless population in Córdoba, where our interns offer free individual legal counselling to those who want it. After working with the couple, the Human Rights office was able to help Gabriel and Viviana to collect and submit the appropriate paperwork so that they could apply for disability pensions from the government. Suffering from an unspecified psychiatric condition, Gabriel, who is 38, has lived on the streets for several years. His partner Viviana, at 49, has mothered seven children, who are no longer in contact with her. These conditions make them each eligible to receive a disability pension from the Argentine government. However, neither was aware of the steps that needed to be taken to withdraw their pensions. This is where Projects Abroad Human Rights interns were able to intervene. In order to attain their disability pensions, Gabriel and Viviana first had to acquire government-issued identification. They then had to justify their disability by proving their inability to work. In the case of Gabriel, that meant proving his psychiatric condition which required a certificate signed by a licensed psychiatrist from a public medical facility confirming his condition. In the case of Viviana, that meant providing medical records for the seven times that she has given birth. After soliciting the pension request and submitting the necessary documentation, as well as completing an interview with a state social worker, Gabriel and Viviana were subject to a 10-month waiting period in which their forms were revised and their pension was approved. Viviana began to receive her pension four months ago while Gabriel received his first check on May 3rd. For the first time in both of their lives, they have a regular income, and the pensions are guaranteed for life. With their newly acquired steady income, the couple is now able to rent a room from a family member, and they are no longer forced to live on the streets. The Human Rights team will follow up with Gabriel and Viviana to ensure that everything continues running smoothly and that they are administering the money appropriately. Gabriel and Viviana’s story falls among a number of similar cases being taken on by the Projects Abroad Human Rights Office. The first step in a retirement or disability case is helping beneficiaries to realize what it is that they are entitled to financially. Secondly, they provide support to carry out the necessary steps in the legal process, from the beginning until they finally receive payment. Finally, they follow up with the individuals in each case, to ensure that things continue to run smoothly. The application process to begin receiving government pensions can be complicated for any individual. For those living on the streets without the support of family, an education, and potentially suffering from a debilitating psychological condition, navigating the pension system alone can be nearly impossible. The aim of the Projects Abroad Human Rights Office is to help the very individuals that the system was intended to protect, but who all too easily slip through the cracks. Find out more about volunteering on a Human Rights internship abroad.